Wisconsin boasts some of the most famous observatories in the history of astronomy. Some of the professional university observatories and all of the amateur club observatories have open houses where members of the public can tour the facilities and view the heavens through very large telescopes. Since astronomers want to get the best view of the night sky, observatories are typically located in more remote areas. This is because artificial light, literally spilling into the sky from the many thousands of poorly-designed light fixtures in the typical municipality, spoils the natural view of the heavens. In fact, when people come out to observatory locations, they are often just as impressed with the naked-eye view of the starry sky as they are with the views through the telescope. Undoubtedly the most famous observatory in Wisconsin, Yerkes Observatory was built in the dawn of the 20th century and boasted the largest telescope in the world at the time. The Great Refractor, with it's 40-inch diameter lens, remains the largest "spyglass-style" telescope every built. 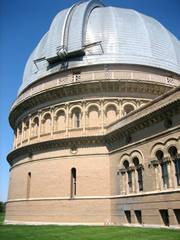 Yerkes Observatory was also the first observatory with physics and chemistry labs, ushering in a new era of astronomy where the very nature of heavenly bodies were studied by examining their light. In the previous centuries, astronomers were concerned only with the discovery and cataloging and mapping of heavenly objects. George Ellery Hale, the Chicago native responsible for building Yerkes Observatory, moved to California and went on to establish Mount Wilson observatory, with it's 60-inch and 100-inch reflecting (mirror-style) telescopes, and ultimately Mount Palomar with the incredible 200-inch Hale Telescope, still one of the largest in the world.